Shachar M. Pinsker. 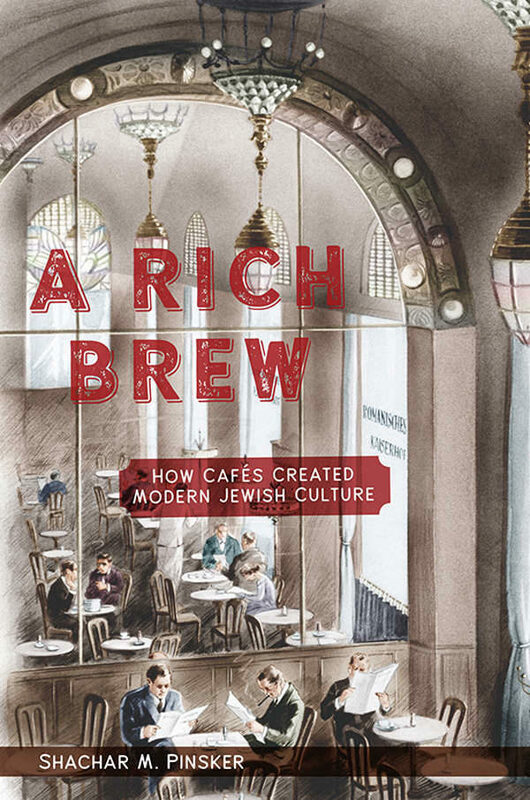 A Rich Brew: How Cafés Created Modern Jewish Culture (New York University Press, 2018), 384 pages, $35. “A Viennese café,” wrote the great literary icon Stefan Zweig in his memoir The World of Yesterday, “[is] a democratic club to which admission cost the small price of a cup of coffee.” Living in Tel Aviv a decade ago, I spent a lot of time sitting in cafés around the city and, in short order, stumbled upon one that fit Zweig’s description: Hanasich Hakatan (“The Little Prince,” named for Antoine de Saint-Exupéry’s children’s classic; locals referred to it as “The Prince.”) The café wasn’t known for its coffee, tea, or pastries, nor for attentive service, but it was the place where young writers, critics, and aspiring intellectuals congregated to socialize, to discuss, and often to argue, about politics and art. Even the barista was a poet who frequently abandoned the counter to share a cigarette with friends. In the back room of the café, editors of rival poetry magazines Maayan and Ketem fought over formalism and post-modernism, while a precocious sixteen-year-old skipped school to sit and discuss Marxism. The Prince was my point of entry to Tel Aviv’s artistic and intellectual community, to write, to collaborate and to feel the pulse of the city. I couldn’t help but imagine myself a part of the enduring legacy of the great European cafés of yesteryear while sitting down for a latte. Pinsker packs his history with titillating behind-the-scenes snapshots of a cast of fascinating and enigmatic Jewish figures in cafés throughout history, including luminaries such as Moses Mendelssohn, Karl Marx, and Theodor Herzl. 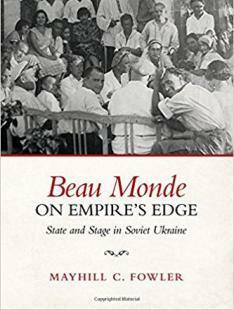 It’s a rather ingenious organizing principle for the book: since there was so much cultural output produced in cafés and, consequently, about them, the author is granted the latitude to quote rich passages from seminal works of Hebrew and Yiddish literature to put them in context. It’s hard to imagine figures like Abraham Cahan, editor of the Yiddish Forverts, and Lincoln Steffens, famed muckraker and author of The Shame of the Cities, crossing paths, yet Steffens served as Cahan’s editor at The New York Commercial Advertiser. Cahan even managed to drag Steffens to his preferred Jewish cafe, Café Herrick on the Lower East Side, where Steffens observed “the debate was on at every table.” Reading about the convergence of literary icons in the Hebrew, Yiddish, and secular worlds in Pinsker’s narrative is reminiscent of the intimate encounters of rock stars in the ‘60s and ‘70s, like when Bob Dylan allegedly offered the Beatles their first joint at the Delmonico hotel in ‘64. As Pinsker explains it, taverns and clubs were frequently off-limits to Jews in Europe and North America, which is why cafés were rare spaces where Jewish intellectuals and literary figures could feel at home. The café often became a de facto Jewish club where writers and thinkers posted themselves each day to hear the news and gossip, network, argue, and write. When they entered a new city, Jewish intellectuals knew where to find like-minded souls. Isaac Bashevis Singer referred to Warsaw’s Tłomackie 13 café, where he began writing in Yiddish, as Der shrayber klub, or “The Writers’ Club.” In his novel Wandering Stars, Sholem Aleichem described London’s Café National where, at any time of day, “you would find a collection of Jews of every type that your heart desired,” including “stockbrokers, doctors of philosophy, traveling salesmen, missionaries, peddlers, actors, diamond merchants, office workers, journalists, chess players, clerks, Zionists, Territorialists looking for a piece of land even in Africa where Jews could settle, and young people from who knew where, shouting and blustering … .” 1 1 Sholem Aleichem. Wandering Stars, trans. Aliza Shevrin (New York: Viking, 2009), 201. 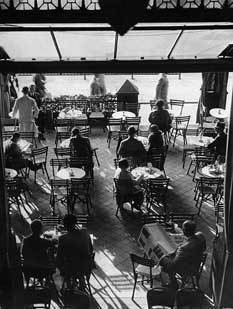 The café in the modern era, as the writers themselves described it, seemed indispensable to creative Jewish life, or “the temple of shadows that alleviates the soul of the artist,” as poet Shimon Halkin wrote in a Hebrew-language newspaper. “Everybody who is anybody in the creative Jewish world turns up at the Café Royal at least one night a week,” Leo Rosten wrote in the New Yorker. 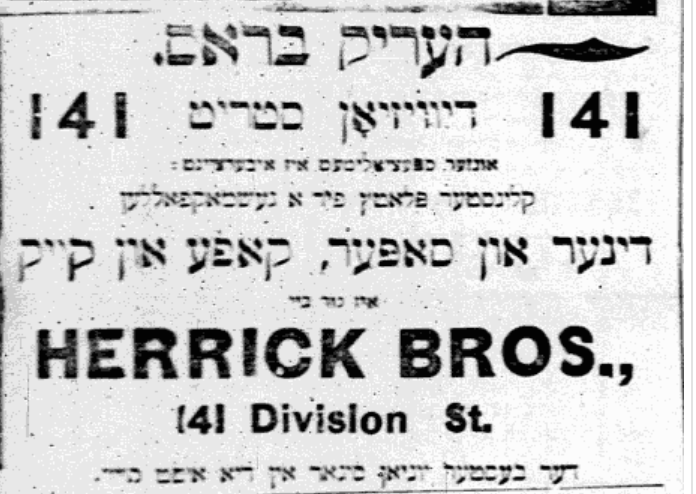 The importance of these coffee-dispensing institutions even led to a New World Yiddish neologism among writers and actors on New York’s Yiddish theater scene in the early Twentieth Century: “kibitzarnya”— a place one kibitzes and socializes. New York writers also referred to the café as the “shvitsbod”—a steam room— an important male space of gathering. As important as the café was to the Jewish literary world, Pinsker reminds us that the space wasn’t open to all. Only those ready to adopt an urban way of life, and, in some cases, leave their families and religious observances behind, sat in cafés as part of the intellectual class. The café was also a remarkably gendered space. “I don’t remember a ladies’ room in the Kaffehaus [sic]” wrote Viennese writer and journalist Vicki Baum. Jewish women, like poet Leah Goldberg in Tel Aviv, were singular figures in the coffeehouses. Goldberg, who visited cafés every day and usually sat alone, was described as attempting to find “a café of her own.” The exclusion of women from these spaces is reflective of the patriarchal public-private space divide of middle class European society, where women in the growing middle class were expected to juggle earning a living and caring for children and tending to the home while men were free to spend their days in creative pursuit. Indeed, the café was seen as unwomanly. The contradictions that riddled cafés reflected the very contradictions of modern Jewish life more broadly. Amidst tables of celebrated Russian and Yiddish writers and German playwrights in Berlin’s Café Monopol, there was a “Hebrew Corner” where Hebrew literature and language thrived. Nevertheless, Zionist leaders critiqued the cafés as a place of consumption, gossip, and idleness. In Theodor Herzl’s utopian novel, Altneuland, he portrays his protagonist as a “coffeehouse Jew” who sits in a café in a Jewish neighborhood of Vienna where a “sickly, pale waiter” serves him as he wastes his time kibitzing and reading. Herzl quite heavy-handedly provides a contrast between the lowly, bookish Jewish male and the more masculine, more efficient Zionist man. Those inconsistencies feel especially rich in the chapter on Tel Aviv, where Hebraists attempted to quash the city’s multilingualism and its ties to European history, both of which were represented by the presence of the café. Perhaps writer and playwright Sholem Asch, a Zelig-like figure who showed up in cafés around the world, best exemplifies Pinsker’s argument that the unique network of cafés that connected Jewish writers to one another led to an unprecedented period of collaboration and literary production. Asch came to Warsaw at the turn of the twentieth century. There he wrote in cafés in both Yiddish and Hebrew, and he even included the café as the site of a pivotal and controversial scene in one of his early Hebrew stories. Drawn to Germany’s theater culture, Asch then moved to Berlin. There, in Café Monopol, he befriended celebrated German-language dramatist Max Reinhardt who staged a production of Asch’s Yiddish-language play, God of Vengeance. Asch then moved to New York for a few years during World War I. Along with Sholem Aleichem, he entered New York’s burgeoning Yiddish theater scene, which thrived in the East Side cafés. Upon traveling to Palestine in 1936, Asch noted the impressive array of cafés and other cultural institutions of Tel Aviv, no doubt after visiting with his transplanted literary counterparts over coffee or tea. The depth of Pinsker’s research through the treasure trove of modern Jewish literature is extraordinary, though there’s an unsettling and glaring omission: what were these modern Jewish figures eating and drinking? To be sure, Pinsker doesn’t promise any such details, since he’s mostly concerned with the cultural developments inside these spaces; though cafés— hardly just empty spaces— offered an array of food and drinks, with evolving menus influenced by region and trends of the day. Who wouldn’t want to know whether or not Stefan Zweig drank espresso in Viennese establishments? Or whether Emma Goldman drank filtered coffee in New York’s cafés? Did Karl Marx take it black, no sugar, as one would expect? To be fair, Pinsker does include a few details. For instance, Pinsker writes that Vladimir Jabotinsky, the Jewish-Russian writer and Zionist leader who enjoyed sitting in the Greek cafés near the port in Odessa, wrote in his semiautobiographical novel: “God’s nectar is really a fragrant cup of Turkish-style coffee, and ambrosia is a rahat lokum [Turkish Delight] and halva.” In eighteenth-century Berlin, Moses Mendelssohn joined Gelehrtes Kaffehaus, a club and debate society, precisely because the club only served coffee and he did not need to worry about breaking Jewish dietary laws. At Café Kassit in Tel Aviv, tea, not coffee, was the preferred beverage, though after sunset, vodka and brandy were the drinks of choice. 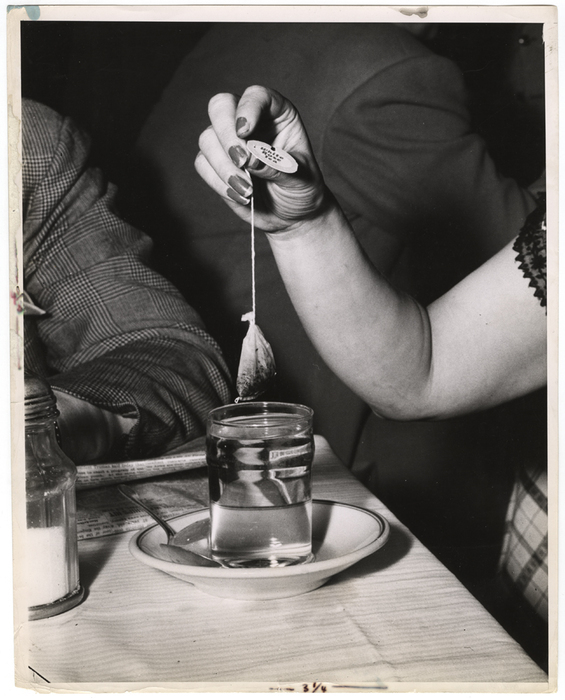 In fact, Jewish cafégoers frequently drank a glezl tey— a glass of tea— at the coffeehouses. But what kind of tea? Alas, to find out what variety of black tea or herbal infusions will require additional scholarship on the subject. Ultimately, the author’s examination of the coffeehouse as a particular urban fixture during one of the most dynamic moments in Jewish history makes for engaging, as well as nostalgic, reading, and begs the question: what has replaced the café in contemporary Jewish life? It seems as though there are more cafés than ever in major cities. In my hometown of Brooklyn, hordes of freelancers type away on their silver Macbooks every day. Journalist Tom Standage writes in A History of the World in 6 Glasses, “The original coffeehouse culture is echoed perhaps best in Internet cafés and wireless-Internet hot spots that facilitate the caffeine-fueled exchange of information, and in coffee-shop chains that are used as ad hoc offices and meeting rooms by mobile workers.” 2 2 Standage, Tom. The History of the World in 6 Glasses (New York: Walker & Company, 2005), 171-172. While the modern hipster cafés that are nearly identical in Melbourne, Helsinki, and Portland may provide a space for the production of work, they don’t necessarily play a pivotal social role in the lives of their customers, nor do they usually function as places that transmit information. Throughout history, however, new spaces to congregate have sprung up, fulfilling different needs, such as cafeterias in postwar New York where a smaller Yiddish literary community sat for inexpensive food and drink (Isaac Bashevis Singer even described the Garden Cafeteria as “a second home.”) and, of course, the Jewish delis, which played the role of “secular Synagogue” among Yiddish theater personalities. Today, Pinsker suggests, the internet may play the role of the modern day coffeehouse. Though online platforms (like In geveb!) can be a place for robust conversation, it’s depressing to think of young intellectual Jews hashing out ideas about contemporary Jewish identity intermediated through digital platforms such as Facebook, sub-Reddits, Twitter and online magazines in place of the frenetic energy of a physical institution like Odessa’s Café Fanconi. There’s no need to congregate in a physical space in a digital forum, nor is there a need to pay for and consume coffee or tea. Nevertheless, I remain hopeful that as long as there are young, creative, and entrepreneurial Jews invested in deeply exploring Jewish life through literature, philosophy, and politics, new hubs for innovation and “IRL” exchange will reveal themselves in due time, and the legacy of the spirit in the cafés that shaped modern Jewish culture will continue. Hopefully there will be pour-over coffee and Oolong tea. Sholem Aleichem. Wandering Stars, trans. Aliza Shevrin (New York: Viking, 2009), 201. Standage, Tom. The History of the World in 6 Glasses (New York: Walker & Company, 2005), 171-172. Yoskowitz, Jeffrey. “Review of A Rich Brew: How Cafés Created Modern Jewish Culture by Shachar M. Pinsker.” In geveb, September 2018: https://ingeveb.org/articles/review-of-a-rich-brew-how-cafés-created-modern-yiddish-culture-by-shachar-m-pinsker. Yoskowitz, Jeffrey. “Review of A Rich Brew: How Cafés Created Modern Jewish Culture by Shachar M. Pinsker.” In geveb (September 2018): Accessed Apr 21, 2019. Jeffrey Yoskowitz is a writer and food producer living in Brooklyn, NY. He’s the co-author of The Gefilte Manifesto: New Recipes for Old World Jewish Foods (Flatiron Books, 2016) and co-owner of The Gefilteria, a purveyor of Ashkenazi foods and culinary experiences.